Indiana Attorney General Greg Zoeller says he plans to appeal to the Indiana Supreme Court a state Court of Appeals ruling that could leave taxpayers on the hook for millions of dollars more in damages from the 2011 stage collapse at the Indiana State Fair. In a 2-to-1 decision, the justices determined the state may be responsible for the civil liability and legal defense of Mid-America Sound, the company that constructed the stage rigging. The Court of Appeals ordered the issue back to the trial court for further consideration. 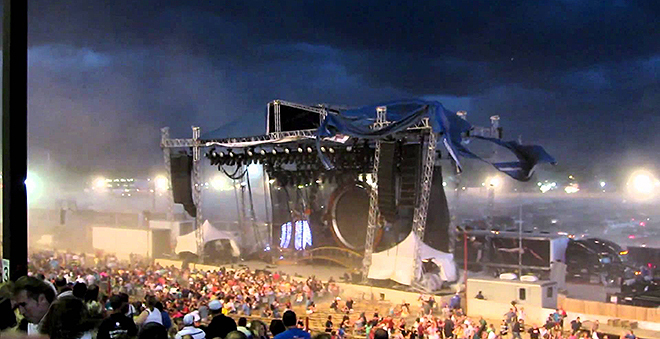 The issue arises out of a civil lawsuit filed by victims of the stage collapse or representatives of their estates against Mid-America Sound and other companies and people involved in the August 13, 2011 concert. The country group Sugarland was preparing to take the stage when powerful winds knocked down the stage rigging. It collapsed into the crowd, killing seven people and injuring more than 50 others. Mid-America Sound claims it had a contractual agreement with the state for indemnification, meaning that Mid-America contends the state agreed to take financial responsibility for any civil liability and legal defense of the private company. The Indiana State Fair Commission disagreed. Zoeller issued a statement saying he “strenuously” disagreed with the Court of Appeals ruling. “Our position is Indiana law is clear that the State cannot indemnify a private party, nor was there any agreement here to do so, and we will continue to fight the stage rigging contractor’s attempt to shift its legal responsibility for the State Fair tragedy onto the public,” Zoeller wrote. Attorneys from Zoeller’s office made several arguments against Mid-America Sound, including that the indemnity provisions were “unconscionable” and “violated the Indiana Tort Claims Act.” The state also claimed that any such agreement was outside the commission’s authority. The attorney general’s office says indemnity for Mid-America would expose the State to an undetermined amount of damages, which is goes against the tort rules. In March 2014, Marion County Judge Theodore Sosin ruled against Mid-America and in favor of the Indiana State Fair Commission, saying the state is not responsible for indemnifying the private company. Mid-America Sound appealed that decision. Monday, the Court of Appeals reversed Judge Sosin’s order, noting that he did not explain the reasoning for his decision. The majority opinion for the Court of Appeals says the Tort Claims Act does not apply here to limit the state’s financial exposure. The justices said there are other “genuine issues of fact regarding the validity and enforceability” of the agreement between Mid-America and the State Fair Commission. It is those issues they are ordering to be sorted out by the trial court. Chief Judge Nancy Vaidik filed an eight-and-a-half page dissenting opinion. She says she questions whether the indemnity clauses are enforceable because they were on the back of an unsigned invoice, and that she believes this is kind of situation Indiana’s tort claim law was intended to address. “I believe that this case is nothing more than Mid-America’s attempt to shift tort liability to the Commission – a tort in contract’s clothing, if you will,” Vaidik wrote. The Attorney General’s response to the Court of Appeals ruling notes that the State already paid collapse victims up to the statutory limits. In December 2011, the State paid $5 million, the maximum allowed under Indiana’s tort claim act. In 2012, state legislators approved another $6 million to help compensate victims and that money was distributed in December 2012.